AUthors jocelyn davies and lindsey rosin in conversation at books of wonder in nyc! Best friends forever? Join YA authors LINDSEY ROSIN (Cherry) and JOCELYN DAVIES (The Odds of Lightning) as they discussion friendship, first love, heartbreak, and high school. Visit the Books of Wonder event page here. THE ODDS OF LIGHTNING is on Buzzfeed! "23 ya books that without a doubt you should read this fall"
"Why you should read it: Four teenagers, one all-night adventure. After growing apart, Tiny, Lu, Will, and Nathaniel are hardly friends anymore. But when a enormous storm threatens NYC, the four friends come together to greet adventure and reconcile their pasts. Set in the throes of this busy city, readers will have no trouble becoming immersed in the lives of these characters." the odds of lightning launch party! If you happen to be in NYC for launch of my book, please come join the celebration! Click Here for the McNally Jackson Event Page! 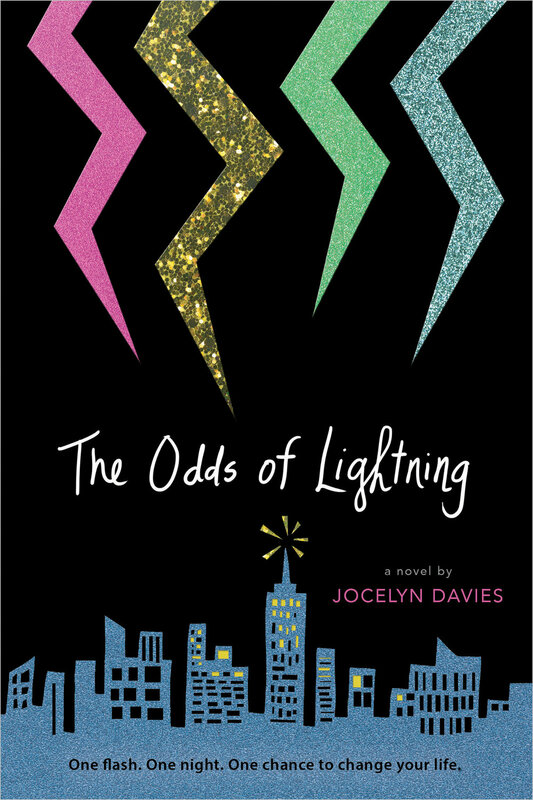 THE ODDS OF LIGHTNING Cover Reveal! Have you heard the saying “The Book of My Heart”? The Odds of Lightning is mine. I’ve been working on it for a long time. In fact, I published three other books while I was writing this one! This fall, it will finally crackle its way out of my imagination and onto bookshelves. And today, I get to show you the COVER! "Besties & The Breakfast Club: These novels are perfect for those who appreciate alternating points of view and narratives that weave several characters’ stories together. Addressing deep issues and strong friendships, heart strings will be tugged." Sara Sargent at Simon Pulse has acquired, at auction, a YA novel called The Odds of Lightning by Jocelyn Davies (A Beautiful Dark). In the story, the lives of four teens intersect by chance during a freak thunderstorm in New York City. When they are struck by lightning, they embark on an epic all-nighter to follow their dreams, fall in love, reconcile the past, and ultimately realize they were brought together to help each other break free of everyone else's expectations – including their own. Publication is scheduled for summer 2016; Jessica Regel at Foundry Literary + Media did the deal for North American rights.